Connecting with visitors through an engaging and educational experience. Create a more integrated museum visit experience for the Carnegie Museum of Natural History. An elevator installation that help visitors discover the historical and chronological connection between destinations across the floors. Given an rather open prompt, I first interviewed two museum staff and conducted literature review on the interior museum design. Two themes – "Anthropocene" and "Content Relevance" – emerged as opportunity areas to address integration. in terms of the integration opportunity in the physical space, I found the Overlook/Staircase area to having potential for clarifying (content) connection between exhibition halls and bringing "the museum's voice" as it is the only area in the museum that has no consistent visual identity. I conducted fly-on-the-wall and interviewed – to learn more about how visitors currently use the stairs and how the experience add to their journey. The research revealed key causes of the connectivity challenges: (1) weakness of museum's visual identity and (2) the feeling of disconnection between the exhibition spaces. On the other hand, no prominent travel/behavioral pattern was found. Before jumping into prototyping, I set of primary and secondary design criteria based on research findings. I made sure to document the causes and avoid going back and forth between ideas. 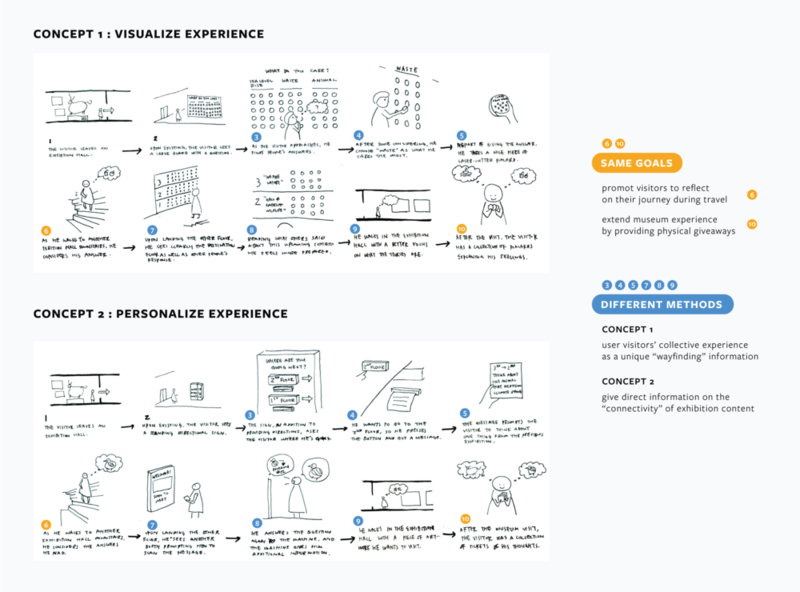 This diagram became very helpful in communicating with the client and making visible how their input impacted the design process. I also incorporated physical artifacts – a component I'm personally invested in – to hopefully extend the experience outside of the museum. "Once a beanbag fell ... we never put any moveable objects in the overlook area since." On the other hand, the staff did like the "messaging" component and the potential of connecting exhibitions. At the end of the consultation, the staff and I determined that the stairway/overlook area presented too many variables and constraints for this type of messaging. Instead, we decided to bring this idea to another vertical travel area – the elevator. Having changed the study area to the elevator, I did another round of fly-on-the-wall research in the elevator. I found that (1) main rider groups are staff and families with strollers (2) in the latter case people face different directions to accommodate the strollers. The fly-on-the-wall findings helped narrowed down the strategic location of visual installation into two – the ceiling and the inner wall. I then developed two low-fidelity prototypes in SketchUp in order to to simulate views in the elevator. Out of the two concepts, the museum staff chose to move on with Concept 1: Storytelling because that (1) it required less staff maintenance and that (2) it have a stronger story-telling component. The concept brought an immersive experience to the elevators riders as they travel from one floor to another. Depending on the travel path, the experience provided (1) indication of "time-travel" (2) information of the destination and (3) statement prompting visitors to reflect their roles in nature. 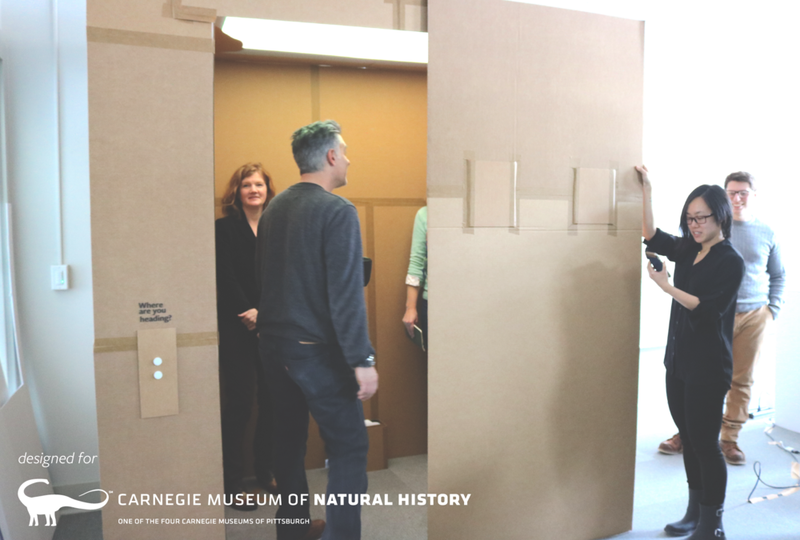 To understand and evaluate the effectiveness of storytelling, I built a full-scale elevator out of cardboard to better simulate the scale and sensory experience. The usability testing reveal that all visitors could see the relevance of the "elevator messaging" to their museum experiences. The depth of understanding, however, can vary amongst different types of visitors (students vs. older adults, etc.). The client and classmates were generally impressed with the acupunctual approach of connecting with visitors in an often awkward context. Curate personalized messaging for diverse elevator riders is discussed as a key next step to strengthen content relevance. Further development of this requires a content strategy for primary museum visitors than can be implemented not just in the elevator but throughout the museum.